SAN RAFAEL, CA, May 27, 2009 – Telltale's first episodic game for Xbox LIVE® Arcade, Wallace & Gromit: Fright of the Bumblebees, releases worldwide today. The first of four episodes comprising Wallace & Gromit's Grand Adventures, the English language game is available for 800 Microsoft points and includes subtitles in German, Italian, French, and Spanish. Today's Xbox LIVE Arcade release brings Fright of the Bumblebees to the living room where players can enjoy the interactive experience in the same comfy environment as a Wallace & Gromit film. Since its first release on PC, Fright of the Bumblebees has been well very received, with acclaim from outlets including London's Sunday Times, which stated: "There's enough mechanical madness, gentle humour and, of course, ripe cheese to please the most ardent fans." IGN honored the episode with an Editor's Choice Award, saying, "Telltale nails the look and feel of a Wallace & Gromit short film." In Fright of the Bumblebees, scatterbrained inventor Wallace and his crafty canine companion Gromit embark on a new honey enterprise, "From Bee to You." When demand out-steps supply, Wallace tries to boost his worker bees' production using a home-brewed growth formula—with comically disastrous results. Playing as both Wallace and Gromit, you must unravel the mess and restore order to the duo's quiet Northern England neighbourhood. The next three episodes of Wallace & Gromit's Grand Adventures will launch on Xbox LIVE Arcade in the coming months. Telltale's acclaimed Sam & Max games are also coming soon to Xbox LIVE Arcade. Telltale is also announcing that the PC versions of Fright of the Bumblebees and the second Wallace & Gromit episode, The Last Resort, are now available for individual purchase for $8.95 at http://www.telltalegames.com. These were previously only available in a $34.95 series bundle. As with Telltale's other series, customers who buy one Wallace & Gromit episode for PC will be able to upgrade to the full season for $26. An endearing and affable inventor. Ever enthusiastic, Wallace's hair-brained, over-ambitious, yet well intentioned ideas consistently get him and his faithful hound into trouble. Wallace has a definite penchant for cheese and crackers, not to mention fashionable knitwear! Wallace's long-suffering loyal pooch. Gromit cares greatly for Wallace even though he's often railroaded into his master’s mad-cap plans. Though cultured and sensitive, preferring order and the quiet life, Gromit displays amazing courage and heroism when it comes to getting his master out of self-made scrapes. Always showing astonishing initiative, Gromit is definitely the intelligent one of the pair. Telltale is a pioneer of new forms of interactive entertainment that build upon strong foundations in traditional and new media. 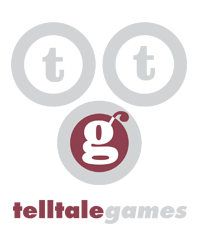 Founded in 2004 by video game industry veterans with decades of experience, Telltale has quickly become the leading online episodic gaming publisher and developer, delivering award-winning interactive experiences that showcase engaging stories, compelling characters, and rich worlds. Telltale has created a regular, ongoing schedule of established online episodic series across all major gaming and entertainment platforms and channels. Telltale's games include the award-winning Sam & Max episodic series; Strong Bad's Cool Game for Attractive People, the first episodic series for WiiWare based on the Homestarrunner.com Flash cartoons; and Wallace & Gromit's Grand Adventures, coming soon to Xbox Live Arcade and PC. Telltale also has created games based on television's popular CSI series in partnership with Ubisoft, and on Jeff Smith's epic Bone graphic novels. Telltale has built a robust digital distribution channel at http://www.telltalegames.com, and also publishes its games with select partners. Aardman, based in Bristol (UK), co-founded and run by Peter Lord and David Sproxton, is a world leader in animation. It produces feature films, television series and television commercials for both the domestic and international market. The studio has won over 400 international awards including 4 Oscars®.